We are five biologists working in teaching and research with a love of natural history, and a passion for ladybirds in particular! Together we run the UK Ladybird Survey to encourage others to get involved in biological recording, and to monitor the status of UK ladybirds. Remy Poland is a biology teacher at Clifton College. Helen Roy is an ecologist at NERC Centre for Ecology and Hydrology. Richard Comont is a PhD student at NERC CEH. Peter Brown is a lecturer in zoology at Anglia Ruskin University. Lori Lawson-Handley is a lecturer in evolutionary biology at the University of Hull. The UK Ladybird Survey was launched in 2005, following the arrival of the invasive harlequin ladybird, Harmonia axyridis, in Britain. It built upon the success of previous recording schemes, such as the Coccinellidae Recording Scheme and the Cambridge Ladybird Survey. The is was to allow members of the public to submit records of both harlequin ladybirds and native British species by means of an online recording form. The UK Ladybird Survey was launched in 2005, following the arrival of the invasive harlequin ladybird in Britain. It built upon the success of previous recording schemes, such as the Coccinellidae Recording Scheme and the Cambridge Ladybird Survey. The aim is to allow members of the public to submit records of both harlequin ladybirds and native British species by means of an online recording form. The harlequin ladybird (above) is native to central and eastern Asia, but has long been used to control pest insects such as aphids in North America and continental Europe. It was first recorded in south-east England in 2004, and has since spread rapidly to become one of the most commonly seen ladybirds in the UK. Members of the public have submitted over 30,000 records of harlequin sightings, verified by the survey’s experts by inspection of specimens or photos, and this has allowed us to build up accurate maps of its distribution and spread. In addition to this, we have received many thousands of records of native British species, which have also contributed to national distribution maps and the publication of a ladybird atlas in 2011. This data is invaluable in monitoring the impact of harlequin ladybirds on native species, with which they compete for food and sometimes even prey upon (above). Sadly, the data has revealed a significant decline in some species, most notably the 2-spot ladybird (above). Rather more encouragingly, we have seen an increase in numbers of the orange ladybird (above)in recent years – this is a mildew feeder that may have benefited from prolonged spells of wet summer weather and lack of competition for food with harlequins (which prey on aphids). Another species that appears relatively unaffected by the harlequin (and the favourite species of many of the survey team!) is the eyed ladybird, a large species whose larvae are covered by an armoury of thick spines which protect them from hungry harlequins (above). It is vital that we continue to assess the status of all ladybirds in Britain, as this will help us to conserve their habitats and communities in the future. As well as submitting records of ladybird sightings, we are also encouraging people to look out for the natural enemies of ladybirds. Our research has shown that the harlequin ladybird is less susceptible to a range of natural enemies, including a fungal pathogen, and some parasitoid wasps and flies (above). This apparent immunity may partly explain why the harlequin has spread so quickly in this country. It will be interesting to monitor this situation over time – it may be that British natural enemies start to utilise the harlequin ladybird as a novel host. Ladybirds are beetles, belonging to the insect order ‘Coleoptera’, and the family ‘Coccinellidae’. Ladybirds undergo a full metamorphosis, hatching from an egg into a larva, then changing from a larva to a pupa, and then finally transforming from a pupa into an adult [ladybird life cycle, larva, pupa- See below]. Ladybirds are named after the Virgin Mary, who was often depicted wearing a red cloak. The red of a 7-spot ladybird is said to represent ‘Our Lady’, while the seven spots represent her seven joys and seven sorrows. The number of spots on a ladybird does not tell you how old it is, spot number varies between species, but also within species due to factors like temperature. There are 47 species of ladybird found in Britain, only 27 of these are brightly coloured and conspicuous, the rest are small, often hairy, and can be difficult to identify at first. Not all ladybirds are red with black spots! Some are black with red spots, some are yellow with black spots, some are orange with white spots, and one species even has stripes! Ladybirds show ‘warning colouration’: they contain bitter-tasting chemicals and advertise their distastefulness to predators with bright and memorable colours and patterns. Most species of ladybird eat greenfly or blackfly, some eat scale insects, some eat plants and some even eat mildew! Hunting for ladybirds is fun, simple and easy to learn. It can be done in your garden, at public parks and woodland, and even in school grounds and churchyards. Three pieces of equipment are useful here: a beating tray or light coloured umbrella, a sweep net and a long stout stick. To look for ladybirds in trees, place the beating try/ umbrella beneath the foliage, and firmly tap the branches with the stick (above photo) . Any insects resting in the tree will fall into the tray and you can try to identify them (ladybirds are easy to spot once you have your eye in, but take a look at the other creatures you might find: earwigs, shield bugs, flies, wasps, caterpillars etc.). Lime, sycamore and oak are particularly good for ladybirds, but you might also like to try some conifers like Scots pine, to find more specialist species like the eyed and striped ladybirds. To look for ladybirds in grass and meadowland, a sweep net can be used. An improvised version can be created by using an old pillow case held open by a coat hanger and mounted onto a handle. Walk through the grass and sweep the net from side to side in a figure-of-eight motion. Insects in the undergrowth will be knocked into the net and can then be inspected. You will also need an identification guide so you can try to determine which species of ladybird you have found. The most useful is the FSC ladybird field guide (a guide for ladybird larvae is also available), but there is also plenty of information and photos on our website, including downloadable ID sheets for the most common species. A more comprehensive coverage is given in the NERC atlas – Ladybirds (Coccinellidae) of Britain and Ireland. Don’t forget to record your sightings online at www.ladybird-survey.org. Happy spotting! Brown, P.M.J., Roy, H.E., Comont, R. & Poland, R.L. (2012) Guide to the ladybird larvae of the British Isles. OP152. FSC. Majerus, M.E.N., Roy, H.E., Brown, P.M.J., Frost, R. & Ware, R.L. & Shields, C. (2006) Guide to ladybirds of the British Isles. OP102. FSC. Roy, H.E., Brown, P.M.J., Frost, R. & Poland, R.L. (2011) Ladybirds (Coccinellidae) of Britain and Ireland. NERC CEH. Roy, H.E., Brown, P.M.J., Comont, R., Poland, R.L. & Sloggett, J.J. (2012) Ladybirds (Naturalists’ Handbooks 10). Pelagic Publishing, Exeter. Its been miserable weather but I hope that hasn’t dampened your passions for minibeasts today as we have dug around in the undergrowth for spiders, woodlice, flies, bugs and woodlice to help tick off our species list! Today we broke a landmark and have less than 300 species left to tick off. As our lsit gets more and more obscure will we be able to tick off the weird and wonderful critters still lurking? Who knows? Tomorrow we’ll be diving into freshwater for utter pondamonium! You’ll be able to craft a cresty, learn all about the fine art of pond dipping and create your own wildlife water feature! More iSpotters photos helping tick species off the list. You can help by uploading your photos to iSpot! Click on this link to get up close and personal with minibeasts living on a decomposing tree…. Many thanks to the BBC Learning Zone for their contribution. Did you have fun crawling, hopping or scuttling your way around today?! You might have come across our Guess the Species of today. It was the…. Common Pill Woodlouse- Curled up! Sam- Editor of UK Nature Blog– tells us a bit more about the common woodlouse. If you’ve never looked at a woodlouse up close you might not notice how interesting and pretty they can be! I was particularly drawn to this one (admittedly a strange phrase given the subject) as it looked more colourful and patterned than the usual woodlice that I see, which are just a uniform grey. It also seemed to run about three times faster than woodlice I’m familiar with. 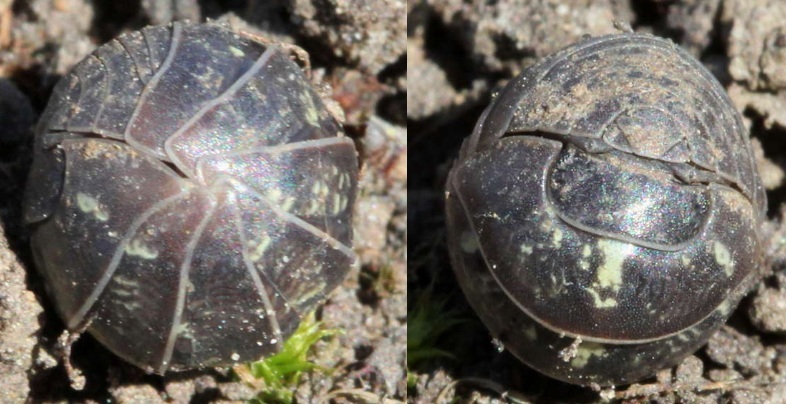 As usual with these things I feverishly looked it up, expecting to find that I had unveiled an exotic invader or even a whole new species, only to find that it is the “common woodlouse”. So how come I haven’t noticed these patterned ones before? I think the usual ones that sneak across the carpet must be the common rough or common shiny woodlice. 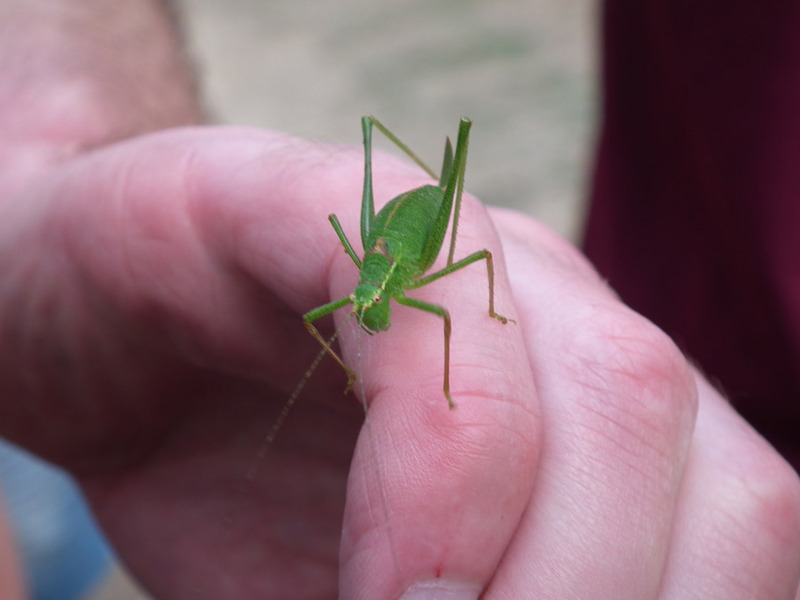 For more info on minibeasts and wildlife please visit www.uknatureblog.com . You can also follow them on Twitter. Many thanks to the BBC Learning Zone. Well, we’ve had a full on day of beetlemania! From our amazing live chat with Sarah Beynon to the brilliant building of bug hotels with our friends at Buglife, we’ve had a beetle loaded blast! We also want to give a quick mention to our friend and expert entomologist Pete ‘the Bug Man’ Dawson who, ironically, has taken ill after being bitten by an invertebrate. Get well soon Pete! Tomorrow we’ll be getting all flustered and feathery with brilliant birds! So join us tomorrow for some close encounters of the bird kind with the Urban Birder – David Lindo and our old pal and bird ringing extraordinaire Ed Drewitt.